Well, I don’t have one for you. 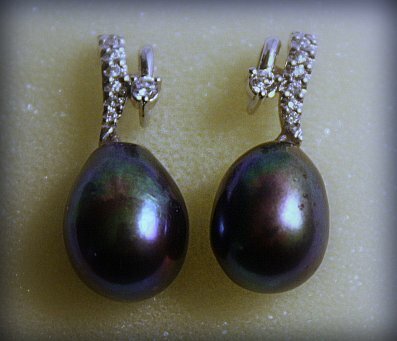 This gorgeous pair of fresh water cultured pearl and diamond earrings could be yours. They’z purrrty, no? All shiny and blingy and in my current possession and right here on my desk and SO close to me that I could just put them on and….NO! No, they are not for me. Although they would look ravishing on me, they are for one of you. Yeah, you heard me right, *insert little grumble-grumble sound here* one of you can get this beautiiiious bling. You may remember that I recently talked about a fundraiser I’m helping to put on for our little friend Mandy Willis, who has a malignant brain tumor called an Optic Glioma, and THANKYOU a million times over to you wonderful people who participated in the TopSpots fundraiser for her. Ya’ll are wonderful and generous and I loves ya for it. But these little pearly beauties fell into our laps and we got to thinking about how best to use them to benefit Mandy. So, here’s the new deal! Over there in my sidebar is the “Donate for Mandy” widget still waiting for more donations. For a $10 donation, you can put your link on there and all proceeds go straight to Mandy’s fund. I also have these ohsofabulous earrings sitting here and if I don’t get them out of my house soon, I swear by all that is holy I WILL not be responsible for my actions…such as putting them on because they would look amazing on me and pretending to have lost them…I’m just saying! The new offer on the table is if you make a $10 donation through TopSpots (or have already) you have an entry into a raffle for these earrings (appraised value $975). Each $10 donation is good for one entry, so feel free to donate multiple times. Now, you may be thinking I don’t have a website, what good does a link do me? and if you aren’t interested in donating via the TopSpot, you can donate directly to Mandy’s Fund through PayPal (to: pursuitgoldens@gmail.com) and in the notes make sure to specify that you’re entering the raffle for the pearl/diamond earrings. Thank ya’ll SO much for your heart and patience as I keep asking of you all to give. But know that if it were YOUR child, I’d hope that someone would be there for your family. Posted in: charitable goodness, events and happenings, living in the aftermath, Mayhew niblets, Mom memoirs, the cancer life, these people are our friends. #1 tres-hearts.com » Kissykissy smoochsmooch.. and Believing for Mandy! I wish I could be there for the local fundraiser.. My heart is there though.. Please hug Natalie for me? And yo, Natalie – hug Anissa!! I will deliver the most awesome Anissa hugs! And vodka! And cyber deliver hugs and vodka to all of you who have been so kind to Mandy. Words do not even scratch the surface of our thanks, but they are all I have. THANK YOU ALL! Anissa, Thanks for giving us an opportunity to help out. My mother had luekemia in her teens and other types of cancer as an adult. I am so glad to have her, even though she is a monumental pain in my behind. Every time I see one of these beautiful kids, I think of my mother. They told her she had Mono for YEARS. Granted, mom came from a family of 9 kids and Grandma was alone so they couldn’t afford to go see another doctor at the time. I am so grateful for the medicine we have now and I hope desperately for the future. Ya know, if you look at the picture of the earrings quick enough and in JUST the right way, you’ve got yourself a bra made out of pearls and diamonds. I need those. As in *need* those. I’m number 5 right now, but I might just have to buy that top spot again. You, are an amazing woman.